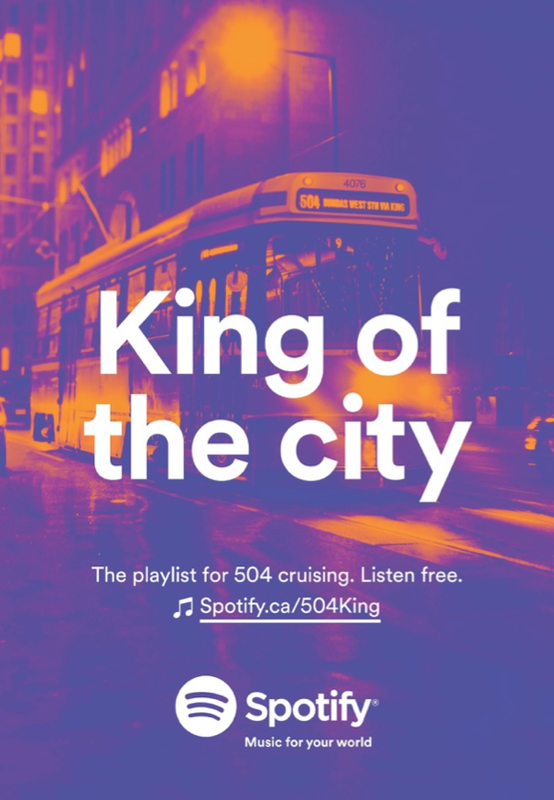 Spotify Canada has launched its first major marketing campaign since entering the Canadian market last September. Called “Music For Your World,” the new Anomaly-created campaign promotes a series of playlists the streaming service created to celebrate Canadian neighbourhoods in four major markets: Toronto, Montreal, Calgary and Vancouver. 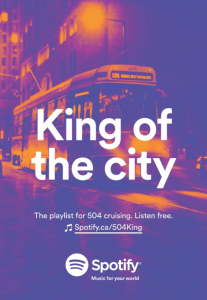 For example, one playlist, “King of the city,” includes songs that are popular in Toronto’s downtown core, while “Stan’s the man” is inspired by Vancouver’s Stanley Park neighbourhood. According to Spotify Canada’s head of marketing, Jamie Herbert, the company dug into its data to find the most popular songs in its highest-streaming neighbourhoods. From there, Spotify’s in-house editors added additional tracks to make the playlists cohesive and rounded them out with suggestions from local bloggers and other aficionados. Each piece of campaign creative showcases a different playlist. Backed by a media buy from Universal McCann, the ads will run on billboards and transit in the neighbourhoods they celebrate. Online, the streaming service is also running a series of banner and display ads. Spotify is also planning a responsive social media initiative as part of the campaign. Using social listening, Herbert said the brand is reaching out to listeners that post about music. For example, if someone posts that they are going to see a band in concert, Spotify might send them a custom playlist of 15 of that band’s most popular songs. It is also running a promotion to coincide with the campaign offering three months of Spotify for 99 cents. “This campaign is really the marketing manifestation of that strategy,” he said. This story can be found at: http://marketingmag.ca/media/spotify-creates-a-soundtrack-for-canada-144741.